Japanese singer/songwriter Ken Yokoyama has been carrying the banner of punk-rock music in his home nation for a long time – first as guitarist for the massive pop-punk outfit Hi-Standard and later as a solo artist. 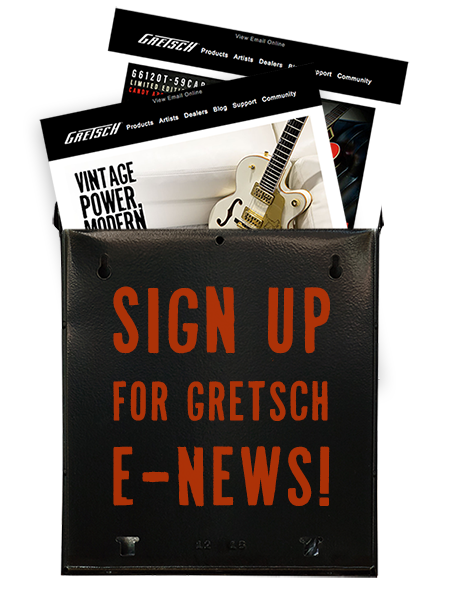 Recently, Yokoyama met with Jeff Cary and Joe Carducci from Gretsch, as well as Fred Gretsch himself to talk about some of the new Gretsch models that he’s been interested in. Stay tuned for some more exciting news from Yokoyama and Gretsch – rumor has it that a signature guitar could be in the works – but in the meantime, check out some photos of the punk icon during his visit below. For more information on Yokoyama, click here. Ken Yokoyama and Joe Carducci going over a Custom Shop Duo Jet. Ken Yokoyama and members of the Gretsch team.